In Spain, the two hundred years that elapsed between the beginning of the early modern period and the final years of the Habsburg Empire saw a profusion of works written by women. Whether secular or religious, noble or middle class, early modern Spanish women actively composed creative works such as poetry, prose narratives, and plays. The Routledge Research Companion to Early Modern Spanish Women Writers covers the broad array of different kinds of writings – literary as well as extra-literary – that these women wrote, taking into consideration their subject positions and the cultural and historical contexts that influenced and were influenced by them. Beyond merely recognizing the individual women authors who had influence in literary, religious, and intellectual circles, this Research Companion investigates their participation in these circles through their writings, as well as the ways in which their texts informed Spain’s cultural production during the early modern period. 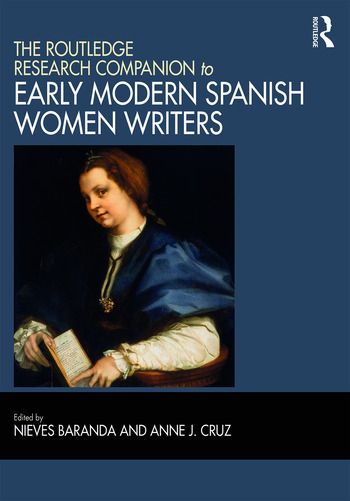 In order to contextualize women’s writings across the historical and cultural spectrum of early modern Spain, the Research Companion is divided into six sections of general thematic interest: Women’s Worlds; Conventual Spaces; Secular Literature; Women in the Public Sphere; Private Circles; Women Travelers. Each section is subdivided into chapters that focus on specific issues or topics. Nieves Baranda is Professor of Spanish Literature at the Universidad Nacional de Educación a Distancia (UNED), Spain. Anne J. Cruz is Professor of Spanish and Cooper Fellow Emerita at the University of Miami, USA.